THE ONE Grand Show is a dreamlike journey through time in search of the person that means everything to us - THE ONE. - Suitable for international guests. Unlike musicals, revue shows do not have a common thread. It is a collage of glamorous show images with a common theme – here, the visions from a young man’s dreams. The dimensions are vast: more than 100 artists on the world’s biggest theatre stage, a production budget of eleven million euros, the most lavish show in Europe. One technical highlight of the new Grand Show is the stage floor, under which is a vast body of fluorescent water. The New York Times recommends the Palast as “must-see” during every visit to Berlin. Lonely Planet is impressed with the “mind-boggling special effects” and “stunning productions”. The Sunday Times dubs the Palast “Las Vegas in Berlin”. On the major review portals, up to 96 percent of guests recommend our show. Shortly after your booking is complete your e-ticket will be sent directly to your email, just print it out and bring it with you to Friedrichstadt-Palast. The tour plays at Friedrichstadt-Palast. Please be there 30 minutes in advance. The tour lasts approx. 2 hours and 15 minutes, including a 30-minute interval. What seats should I choose? 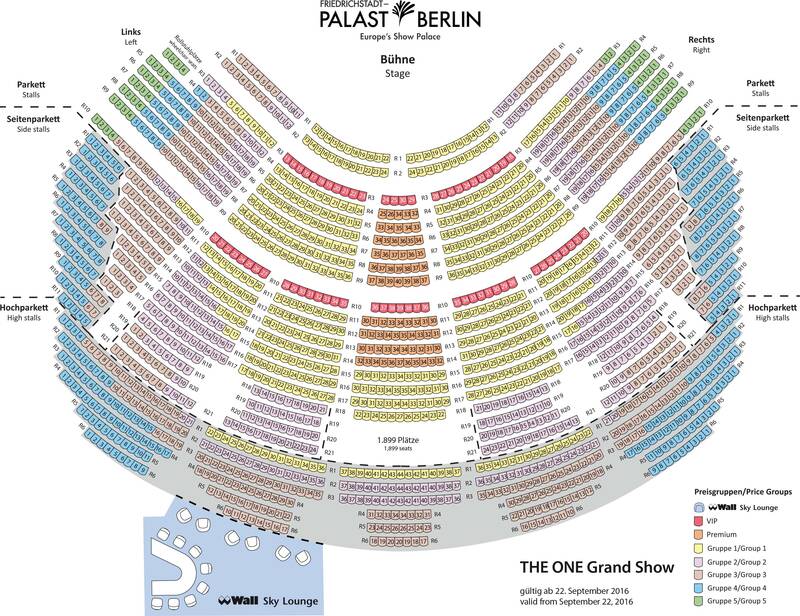 You can see a seating chart of Friedrichstadt-Palast here. The recommended minimum age for the Grand Show is 10 years. Children under the age of 6 will not be admitted. Is the show suitable for people who don't speak German? Absolutely. The show is also suitable for international guests, who do not speak German. Yes, children's tickets are available for children between age 6-14. Children under age 6 are not permitted to the show. The show plays Tuesday, Thursday, Friday, Saturday and Sunday at 3:30 PM & 7:30 PM.